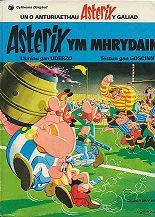 Publisher: Gwasg Y Dref Wen, Cardiff, Wales (1976-1981). "The Druid is Crycymalix a reference to 'Cryman'/'Sickle' which of course he carries with him at all times. The Bard (or should I say 'Bardd'!) is called Odlgymix a reference to 'Odl Gymysg'/'Mixed Rhyme' - a very appropriate name! The chief is Einharweinix - 'Our Leader'. With no book to hand I'm not exactly sure of the spellings they chose, or of the other character's names. Oddly, though, I can remember the Roman camps around the village - Bolatenae/Thinbelly, Cloclarwm/Alarm Clock, Bagiautrwm/Heavy bags and Ariole/After Him. " Further information provided by Dafydd Gruffydd from Cardiff.